MOMables Lunch Planing Service Can Save You $2000 a Year! Bringing your lunch to work can be a quick and easy way to save money. If you’ve gone to the grocery store lately, you might have noticed that prices have increased over the past year. If you’re working and rely on a quick drive-through or cafeteria trip for lunch, then you are probably spending between $40-60 dollars per week. At a café or restaurant, you are definitely spending more. In my pre-kids era (back in my corporate job days) I spent an average of $75 per week on lunch, or $300 per month, or nearly $1200yr! (Thank you, Quicken for keeping track) WOW, that could have translated into a long NYC shopping weekend, or a beach trip! Have a spouse? Make that x 2. You don’t know what to pack? You can’t stand eating left overs the next day? You cook for one? Are you so exhausted after getting the kids to bed, and that making their lunches seems like an impossible item to check off on your to-do list? You are not alone. Lucky for you, I am the Modern-Day Lunch Lady! The Right Tools Make the Job Easier. Here are 3 simple steps you can take now to start making healthy lunches at home—and start racking up the savings now. 2. The right containers make a BIG difference. Since saving money is our focus here, purchasing a re-usable and durable lunch container is cost effective over time. This will replace many disposable zip bags that would be thrown away every day (over $240 a year for a family of six). The search for something that will work for your entire family can be overwhelming; there are over 1,880 options on Amazon alone. In my household you’ll find. Easy Lunch Boxes. We have two sets at our house and the first set is over a year old. They are durable, are BPA, phthalate, PVC free, and keep the food separated in their 3 compartments. Packing lunch in these for our entire family is a breeze and the different colors help everyone identify the rightful owner. I no longer need containers of different shapes and sizes for my family (no more lost lids either!) Another important benefit: they keep adult portions in check. You can also go stainless steel and other all in-one options. But remember, they have to work for you. 3. Cook your options ahead of time. You’ve heard of “bringing left overs to work” but what you really need to think about is re-vamping that roasted chicken into other things. Instead of grilling one chicken breast for dinner per person; add an extra one for lunches. Love roasted chicken? Make two. With the extra chicken you now can make chicken quesadillas, chicken salad, bbq chicken sandwiches, black bean chicken burritos, chicken and pasta… just to name a few. If you are making it for dinner, consider cooking up an extra portion or two per person anytime you cook chicken, pasta, pork or pot roast. Revamping dinners into delicious lunches is easy when you have the food you need already prepared. And it’s very cost effective too! We love options. Who doesn’t like looking at a menu and selecting something delicious? Sandwiches 5 times per week can get boring very fast. You need to think outside the slice. Buy pita pockets, whole-wheat subs, pastas, bread rolls, wraps… the possibilities are endless. You can store them in the fridge or freezer and take out what you need. Having options at home can save you lots of money; at least $8 per day! Nobody wants to sit at his or her desk while the rest of the office goes out to lunch. Get a lunch buddy. Social time is one of the biggest reasons we go out to eat. 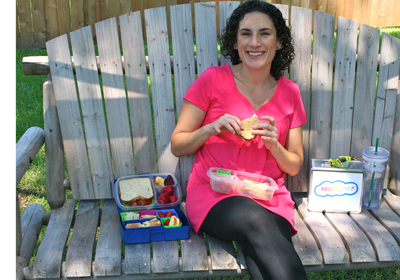 Instead, pick a bench outside the office or a park near by; fresh air is the perfect side dish to your lunch. If saving $2,000 dollars per year by bringing your lunch to work is not reason enough, think about your new lunch accessories. Of course, you know you are going to shop for a stylish new lunch bag, cloth napkin, and the perfect stainless drink container; right? Everyone else is doing it! Laura Fuentes is the Chief MOM at MOMables™. A wife, mother of 3 and a lunch enthusiast who insists on healthy, wholesome food for her family. On her personal blog, Super Glue Mom, she writes about motherhood, green living, deadlines and keeping her cool, even when her kids super-glued her hair. She’s also a food contributor to numerous sites, and helps parents overcome the difficulties of cooking for picky eaters. Craving Manolos but got ballet lessons and bills to pay? Guest post blogger Rosanne Hart, AKA “The Spexy Lady” shows us how to stash away extra funds in style! Our Twitter Party Winner Has Chosen Her Charity! RSVP to join me on May 2nd as I co-host a Tweet Chat with our partner, AboutOne. Enter to win a $100 Amazon Gift Card plus a $100 donation to the charity of your choice. Spring is almost here—It’s time to de-clutter! And while you’re at it, why not put your used items to work by letting them earn you a few extra dollars or a tax deduction? Cha-ching! We’ve got a great refresher on customer loyalty cards and a sleek new way to get all those cards out of your wallet, off your keychain and into your hi-tech world! Never forget your coupons again—because now they can be right on your iPhone (or any smart phone)! Learn all about this brand new smart phone app that finds coupons and deals in your geographic area and has them ready when you visit the store. Shopping at club stores like Costco and Sam’s Club can save you a lot of money. But these stores are also great at getting you to spend more than you planned to. Here’s an insider tip on how to save money by avoiding a common club store tactic. A lightbulb seems so dinky, why worry about it, right? Wrong. You’ve hear it before, but you’re still not doing it. Read on to learn why upgrading to compact fluorescents can save you serious cash and do some good at the same time. Let’s face it: spending money is fun. For some of us, it can even be addictive, so we must find a way to escape that trap. Here’s a little trick for reigning in spending that’s both effective and fun—why not give it a whirl! You should never, ever pay for anything you don’t want. And nobody wants to pay credit card late fees. Here’s how to avoid those awful, expensive hated fees, once and for all. Those little recurring payments that we sign up for don’t seem like a big deal at the time. But when you add them all up, month after month, year after year, they really do add up. Especially if you’re not getting the value out of them you though you would. So cancel one thing today! You know the feeling. You’ve got 36 new messages in your inbox and you’re hoping that at least a few are from friends, but most are from retailers trying to get you to buy something. And you know what—they are really, really tempting. Why not remove the clutter and the temptation?